Many Facebook Users used to ask a question to their friends that is "How to delete a Facebook profile or account?" Mostly people deactivate their account and thinks that their account is deleted from Facebook permanently. But this is not true. 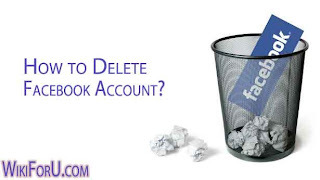 Deactivating your account doesn't means that it is completely deleted or removed from Facebook. No, even this is temporary blocking your Facebook profile or we can say temporary hiding himself on Facebook. Before proceeding let us understand what is the main difference between deleting a Facebook account and Deactivating a Facebook account. What is the difference between deleting a Facebook account and Deactivating a Facebook account? Deactivate Account: Deactivating your account means temporarily blocking you on facebook. This means if you deactivate your facebook account then any friend, family member or any facebook users can't see you on facebook,not in search results or anywhere else. But the whole data stored in your account will remain untouched in Facebook's Servers. This option is for users when they want to stop using facebook for sometime and wish to return back to facebook after sometime. When they Login after sometime, their account gets activated automatically and you can use facebook as before. All your friends, Pictures, Likes will remain same as before. Please note that Facebook won't delete anything related to your profile from their servers. Delete Account: Deleting your Facebook account means permanently removing your profile, your infomation and your whole data from Facebook. In this, you can't Login back to your account. All your information will be deleted. You will be able to create a new account using that Email ID. Fill your Email Address in Email and Facebook Password in Password fields. Now left that page open. Now your account will be deleted and you will have no longer access to your Facebook account or Timeline. Now you can use your Email ID to create a new Facebook Account. Please feel free to comment here if you have any problems.